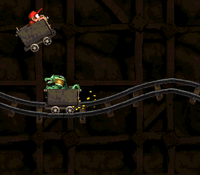 Mine Cart Carnage is the seventh level in Donkey Kong Country. It is also the second level in the Monkey Mines area. 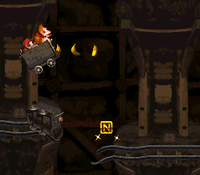 Taking place down a mine shaft, this is the first level in the game where the Kongs must pilot a Mine Cart, jumping over gaps and buffers on an old, rickety track. They also encounter many broken mine carts throughout the level, which they must jump over to avoid taking damage. After the midway point, Donkey Kong and Diddy Kong also must also avoid Krashes, the cart-riding Kritters who charge at them, attempting to knock them off of the track. One of these Krashes appears at the very end of the level, right before the exit, so the Kongs must remain focused the whole level. The Kongs begin the level on a solid ledge with a DK Barrel and an Auto Fire Barrel on it. 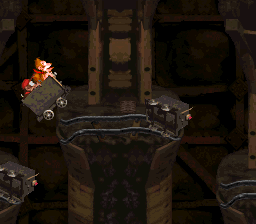 The Auto Fire Barrel can blast the primates over an abyss and onto a mine cart, which immediately begins to pull them through a trail of bananas and down a hill to a few more bananas floating in the air. After dropping off of the edge of the track and landing on a separate track, they are lead up a hill towards a pit with the letter K hovering above it. A large hill with another small pit at the end of it follows here, with a separate track after it that the primates must jump to so they do not fall. Three more pits separating a trio of solid platforms are ahead. Once the Kongs cross them all, they ride down a steep hill and approach two more pits. They find themselves on a higher platform each time they cross one of the abysses. After they cross the pits, they ride downwards and encounter another pit that is followed by the letter O and a large hill. As the cart wheels the heroes down this hill, they come past a small pit with a Banana Bunch in it. They then ride up a smaller hill, where another abyss is present. Another hill follows the pit, but a large piece of it is broken off. A small section of the track is left between the two broken parts of it, and it holds an Animal Token of Enguarde. After passing this broken piece of the track with the smaller track in the center of it, the primates ride down a straight, bumpy railway with another track hanging above it. The level's Star Barrel and a DK Barrel can be found here. Diddy Kong jumps over a Krash. Once the Kongs pass the Star Barrel, they ride up a hill and reach a small pit with a broken mine cart at the beginning of it. Another broken cart can be found on the bottom of a curved track on the opposite side of the abyss. The large gap is located in the track ahead of here, but a slanted part of the track is also within the gap. The Kongs can use this piece of the track to progress safely to another broken mine cart that they must dodge. Immediately after jumping over it, their mine cart rolls them down a hill towards a small pit with another broken cart next to it. A second pit can be found just ahead of here after the letter N with an additional broken cart in front of it. If the heroes manage to pass over this pit, they make their way onto a straight, bumpy track with a Krash rolling down it. A separate piece of a track hangs above this with some bananas on it. An abyss is located ahead, and two tracks are after it. The top track is small and does not hold an Extra Life Balloon, unlike the lower track. After passing this area, the primates ride up a hill with a Krash on it and then encounter another small pit with an additional hill after it. As they ride along the curvy track ahead of them, a few more Krashes get in their way, until they reach the end of the track. Another piece of a track is located below it that can catch the Kongs. A pit follows this area with a Krash found immediately after it. Once they pass the foe, they head up a small hill and ride towards the letter G, placed just before a small pit that it followed by a few others. After the duo jumps over the final abyss, they ride down a curved path with a broken part of the track ahead of it. A slanted piece of a track floats between the broken sides of the main track, and the primates can use it to cross. After they make their way over the abyss, they immediately reach another that is followed by a hill with a Krash traveling along it. A large, broken part of the track can be found near here with two smaller, slanted piece of a track within it. They can use the track pieces to progress over the abyss and towards a hill slanted in a downward position. A few Krashes ride up it. The primates travel towards four small pits after reaching the bottom of the hill. Broken mine carts lay before the last three of the pits. After crossing the last of the obstacles, the heroes reach a sign that indicates that the level is near complete. After riding along the remaining part of the curvy track, one final Krash approaches them. Afterwards, they pass an exit sign and enter a tunnel that leads out of the level. The Kongs near the letter "N"
K: The letter K can be found in an abyss early on in the level. O: Shortly before the level's Star Barrel, the Kongs ride through an area full of hills. The letter O can be found in this area at the bottom of a hill, which is located just before another hill with a Banana Bunch around it. N: The heroes reach the letter N on the edge of a small platform before encountering the first Krash in the level. G: The letter G is located immediately before the fourth-to-last broken cart in the level. At the beginning of the level, the Kongs need to jump over the Auto-Fire Barrel that shoots them to the track and stay near the left wall to access the hidden Warp Barrel, warping them to the stage's exit. This Warp Barrel was removed in the Game Boy Color remake, but it appears in all other versions of the game. The Kongs should jump over the Auto Fire Barrel at the beginning of the level to fall towards a camera icon, which hovers above a hidden Warp Barrel. It gives them a a photograph for their scrapbook, displaying a group picture of Donkey and Diddy Kong in a Mine Cart. The Kongs ride under some bananas at the beginning of the level. The characters jump to the letter "K". The Kongs approach a broken cart. The Kongs are attacked by the final Krash in the level. ↑ @Ghoulyboy (10:20, September 11, 2015). More #DKCrevealed levels. Mine Cart! Coral! The Mine Cart was inspired by Indy Jones, watched it loads on Laser Disc. Twitter. Retrieved July 23, 2018. This page was last edited on April 5, 2019, at 12:24.